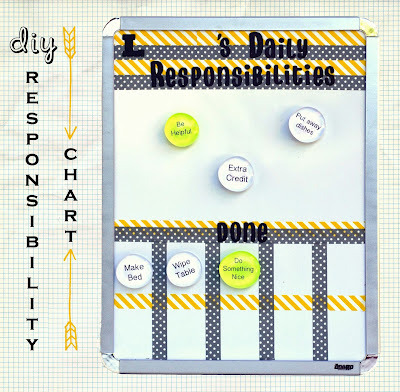 Have you ever made a chore chart for your family? Did it work? It's always been something that I thought we should do, however I could never think of a way to make it work for my family. After giving it a lot of thought, and also figuring out what motivates my children, I finally decided to give it a go. But instead of "chores", I wanted to focus on responsibilities. Here's how my version works-- 1) Every day I choose a variety of daily responsibilities and place them at the top of the chart; 2) When the kids complete their responsibilities, they place it in the "done" section; 3) Discuss at the end of the day-- dinner... or anywhere that we have their undivided attention. Responsibilities are more than just a chore to "get through". I want my kids to think broader than that and realize that their responsibilities are more important than just helping out around the house. And yet they are just five and seven, so I also need to keep it real! So at five and seven, they can start doing some serious tasks! 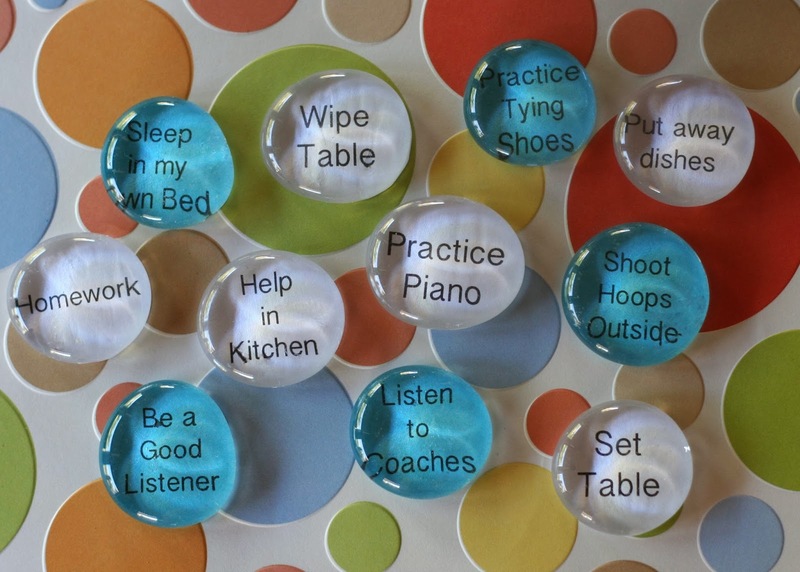 For their daily tasks, I kept it simple-- do homework, wipe table, set table, make bed, etc. Then I threw in some special things that they are working on-- practice balance (for my aspiring pitcher), shoot hoops (for both young hoopsters), practice piano (I'm not a tiger-mom about piano so my kids actually like this one!). To go along with their everyday tasks, I also rotate in a few responsibilities that are more "social" than actual tasks-- Be helpful, Do something nice, etc. Like most children their age, my kids sometimes get sucked into the pitfalls of childhood-- teasing each other, bringing each other down instead of lifting up, thinking they are the center of the universe, etc... Actually, I know some adults who haven't advanced passed that stage! So I think it's good to start young with developing those important social skills. More details on social responsibilities later. Do you pay your kids to do stuff around the house? I've decided that for now I don't want my kids to associate their responsibilities with money. It just doesn't seem right to pay for daily tasks that they should already be doing. Now an awesome task over and beyond the call of duty may be worthy of reward, but setting the table and putting dirty clothes in the laundry basket... I think not! Social responsibilities-- They're often overlooked, but in my opinion, if you really want to raise good people, you need to set the example and prompt often. Since they are young, I kept it simple-- Make someone smile, Be thoughtful, Do something nice... and Be nice to your brother! All general enough, but these also serve as topics for the dinner table. So instead of "How was your day? 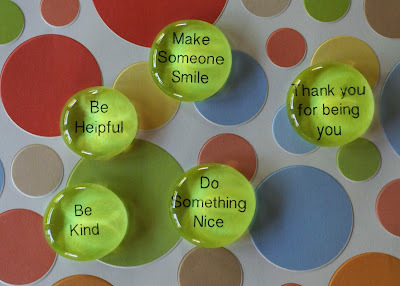 ", we ask questions like "What nice thing did you do for someone today?" and "How did you show kindness? ". Maybe this is too altruistic for some (especially those lacking social skills. Ha! ), but these are just little prompts that will hopefully remind them to step outside of themselves and think about others every now and then. I said earlier that I wouldn't be paying my kids to complete their responsibilities. But then again, sometimes human beings are motivated by rewards... 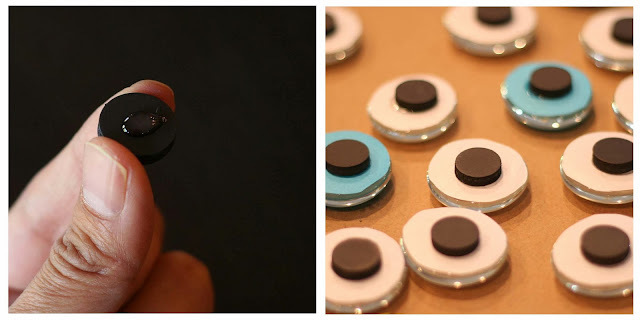 So, to keep it fresh, I've made special magnets like "No chores today! "; "Family Game Night! "; "Go out for ice cream!" to throw in when they've been good at keeping up with their responsibilities. I also included some "compliments"... I'm not sure about these yet. I want to be positive but don't want them to turn into meaningless praise either. The jury is out whether I'll put these in the rotation. Decorative glass magnets were popular a few years back. They're easy to make and inexpensive, so I decided to use the same technique for our Responsibility Chart magnets. Print out your responsibilities. 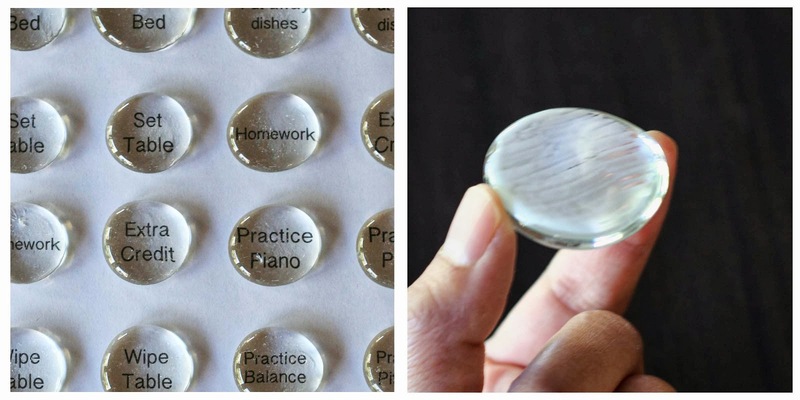 The flat glass marbles are irregular in shape, so you may need to find the right size before gluing it down. Coat the back of the glass marble with a thin layer of mod podge. Press the marble down onto the paper and let it dry. 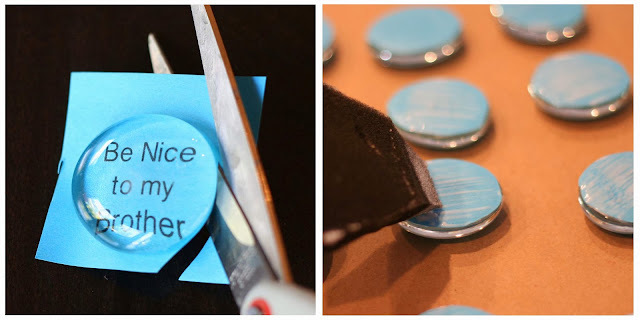 Once the mod podge is dry, cut around the glass marble. Coat the back of the paper with another thin coat of mod podge. You can skip this step if your paper is thick. However, if you're using printer paper, you'll want to do this so that the adhesive for the magnet doesn't soak through. Add a small dab of strong adhesive to the back of the magnet. Place it on the back of the marble and let it set for 24 hours. Then the fun part... decorate your magnetic white board! I used washi tape because it's easy to remove if I want to change things up. 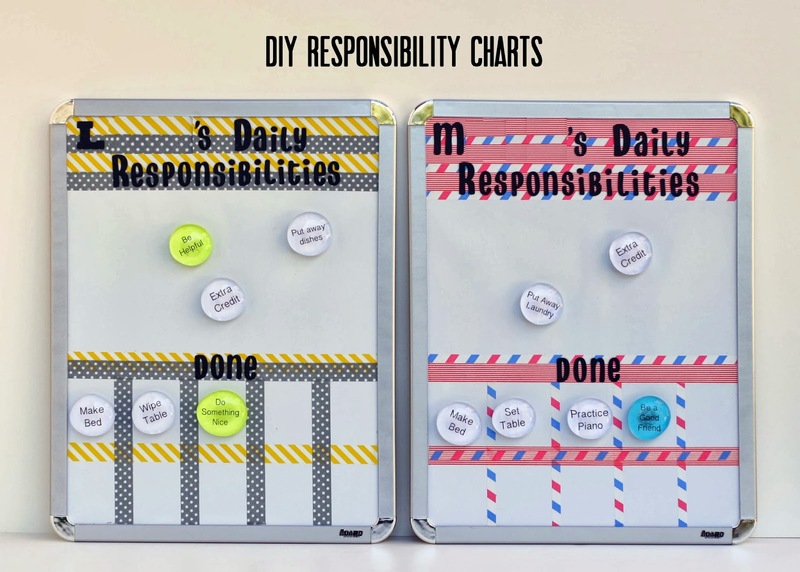 So this Responsibility Chart thing... Is it sustainable? I guess only time will tell! 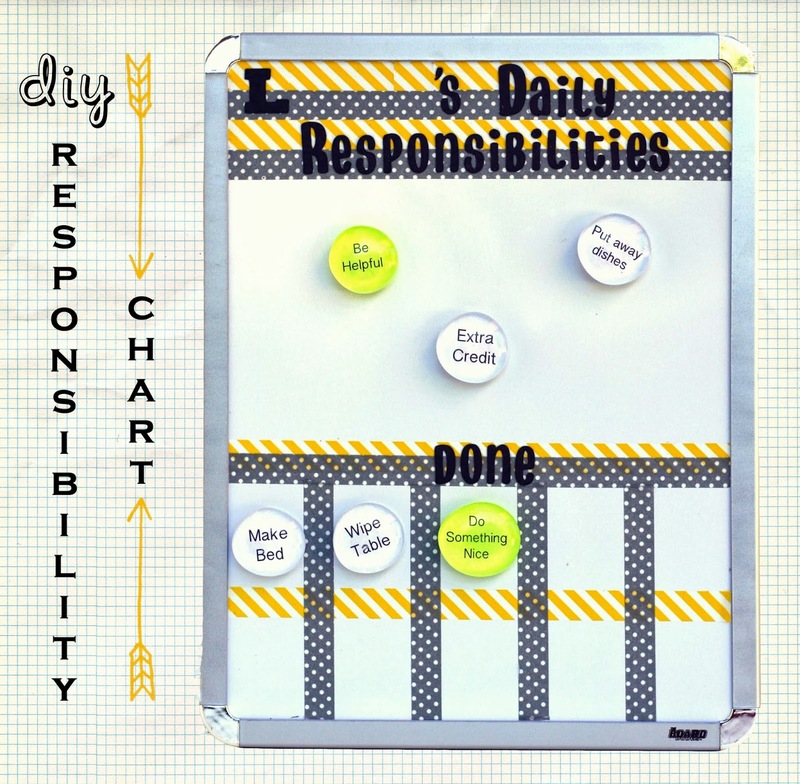 Do you have a chore/responsibility chart that works? 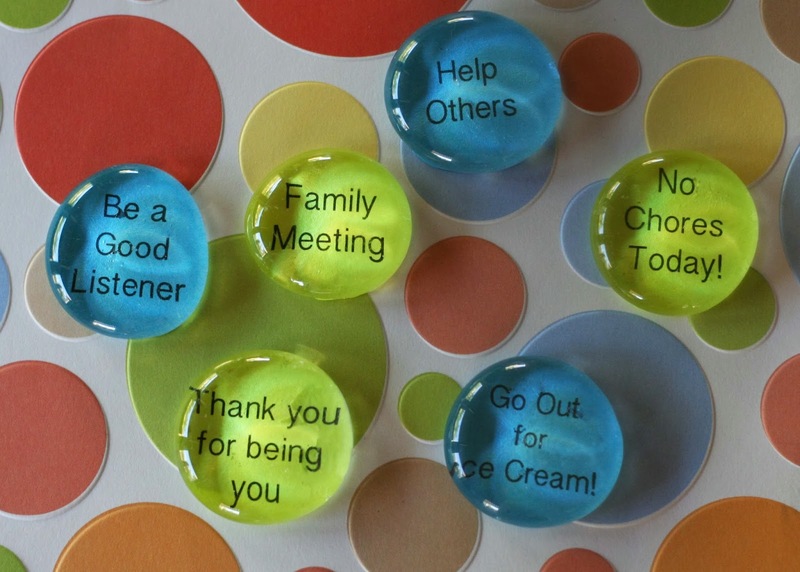 How do you motivate your kids to help out and take care of their responsibilities?